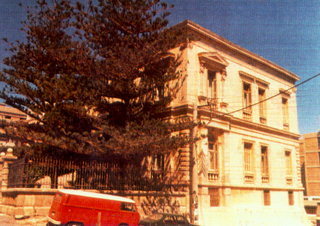 The Museum is housed in a neoclassical building which belongs to the Philanthropic Institutions A. and M. Kalokairinou. It was designed by L. Kantantzoglou and built in 1870, in the place of an older mansion. It was fired by the Turks during the events of August 25, 1898 and was reconstructed in 1903 on the plans of K.Tsantirakis (preserved today), based on the layout of the previous structure. It has been declared a Historical Building and a Work of Art and is protected by a preservation order. The two-storeyed building is a wonderful specimen of the Neoclassical architecture. Its entrance is formed by a marble porch and columns made of poros stone. The windows on the facade of the ground floor and in the south part of the east and west walls are crowned by arched lintels and framed by caryatids (Hermae) supporting a pediment. The rest of the windows have plain, rectangular frames. The north side of the building is modelled as a scarpa following the Venetian model. The courtyard on the south side of the building is enclosed by a Neoclassical fence. The interior is decorated with friezes depicting scenes from the Iliad and the Odyssey. Its presents form (19 rooms, 2 court yards, library etc.) is a combination of neoclassical and modern architecture. The works of expansion began in 1989 and were completed in 1997.